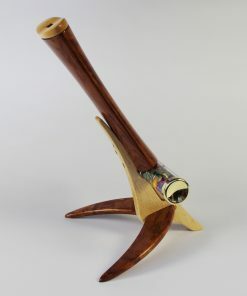 These kaleidoscopes and teleidoscopes are available in two wood types, maple, a lighter color, and bubinga wood, which is darker and more reddish brown in color. These handmade creations are brought to a finely finished state by a 25-step sanding and polishing process. The end result is a piece of artwork that is as much a pleasure to see in your home, as it it is to hold and look through. They are all generally available with either two or three mirror configuration. The 2-mirror version will give you a circular mandala image surrounded by a black field. some people prefer the symmetry of this configuration. The 3-mirror version provides the same mandala, but instead of the black field the third mirror adds an explosion of patterns that goes to the edge of your view. 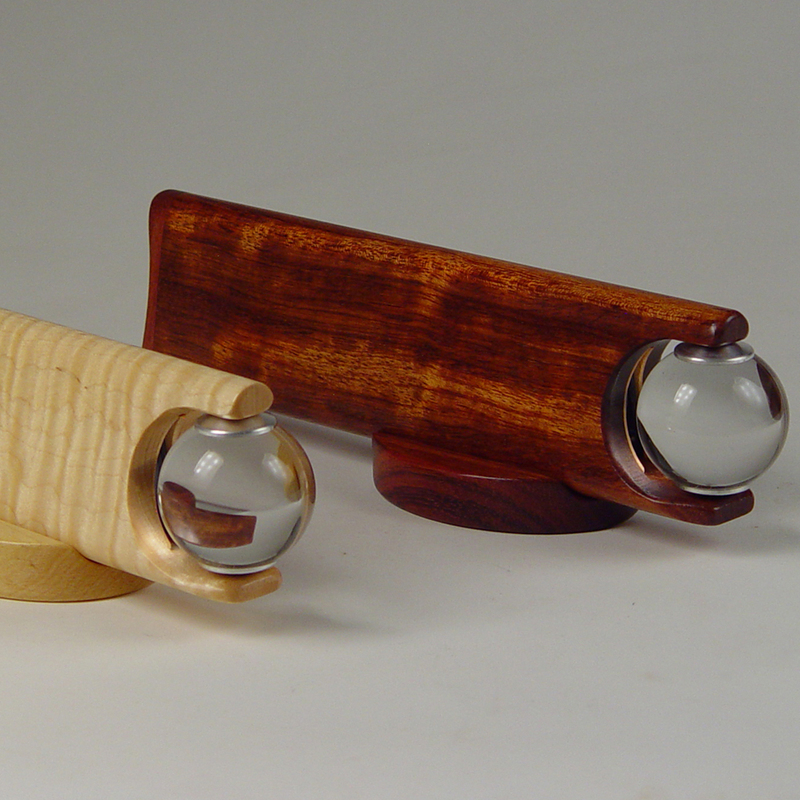 The Teleidoscope is a handmade kaleidoscope and it is fitted with a two-inch crystal ball. Rather than looking at objects within a cell like on a traditional kaleidoscope, you can look at anything in your surroundings such as out windows, faces, cars going by, the sky, pictures on your wall and view an amazing kaleidoscopic image. As you gaze around you the image continuously changing view. It is really amazing what happens to the most mundane things around you when you gaze through this device. 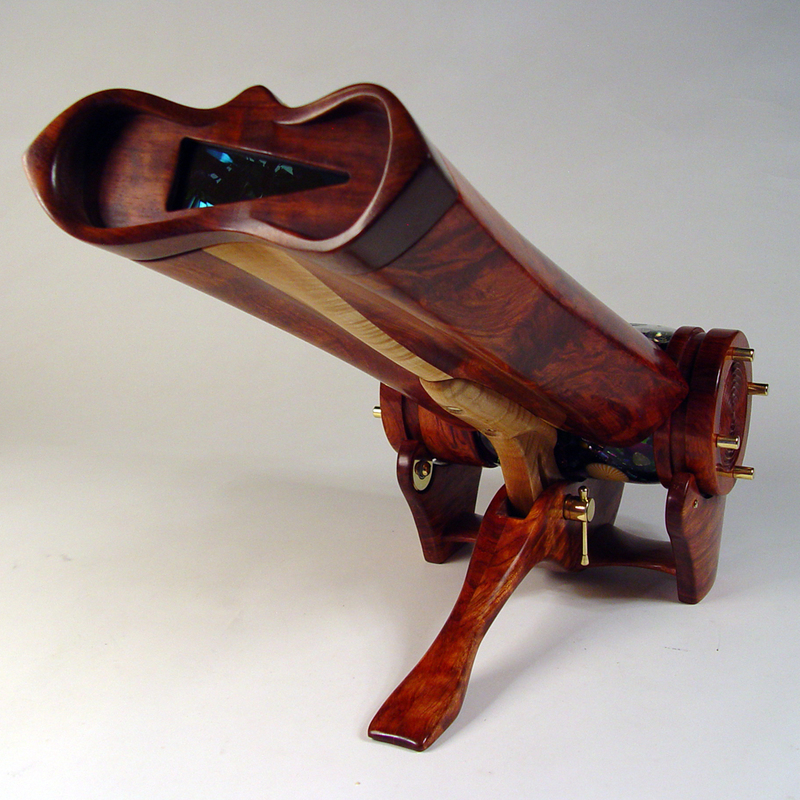 Teleidoscopes are $205. The “Timefly” is a kaleidoscope that will captivate and delight you. The long cylinder can be twisted and slid from side-to-side giving you a pretty much unlimited viewing experience. Its flowing shape will enhance any space. Timefly’s are $660. 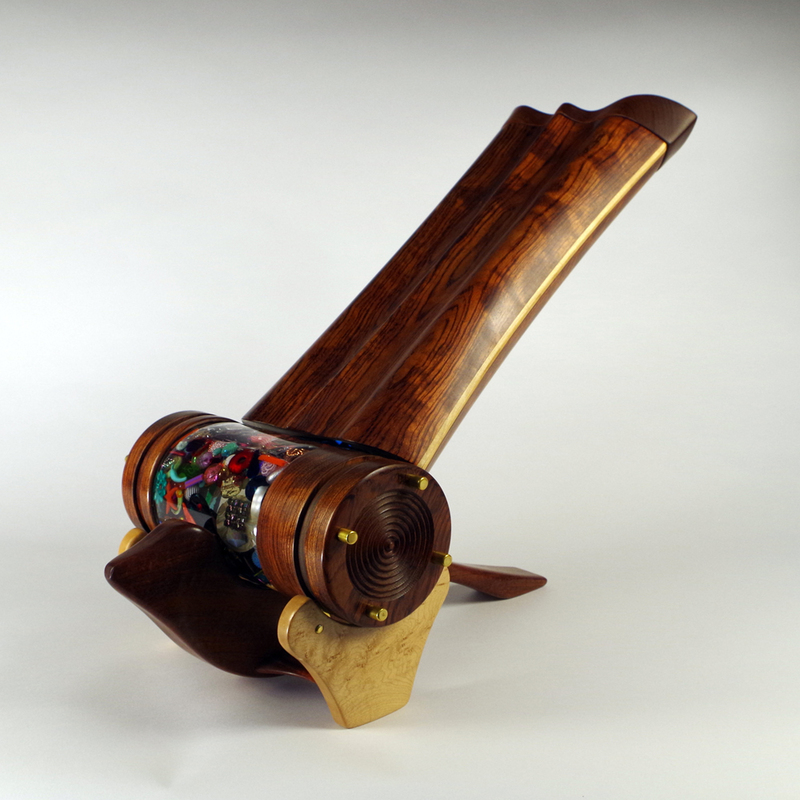 The “Turniton” (Turn-it-On) is a handheld kaleidoscope that will bring color to the darkest of nights. 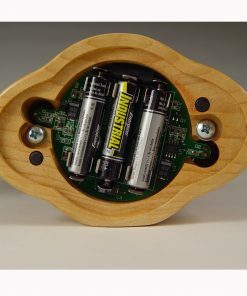 This kaleidoscope has its own internally powered led light source, using (3) AAA batteries. By simply pushing down on the brass ring of the bead cylinder, the built-in light will come on and you will have a minute of beautifully illuminated kaleidoscope viewing. The light goes off by itself. 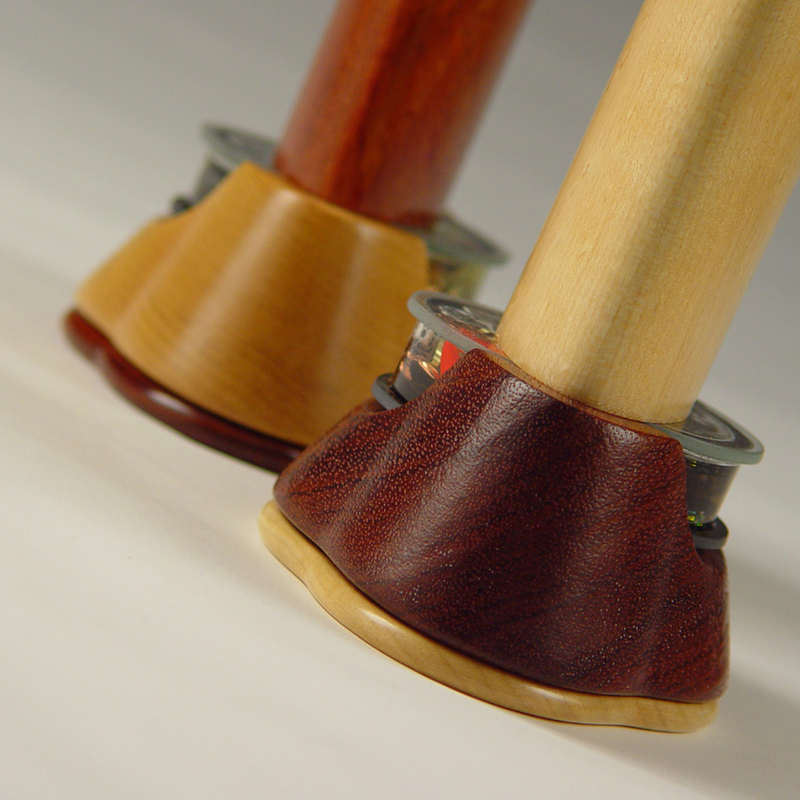 Two color options…if the main body is primarily bubinga wood, the trim will be maple, and vice versa. It has an elliptical shape making it easy to hold. All of the components go through 25-step sanding and finishing process which makes them a tactile delight. 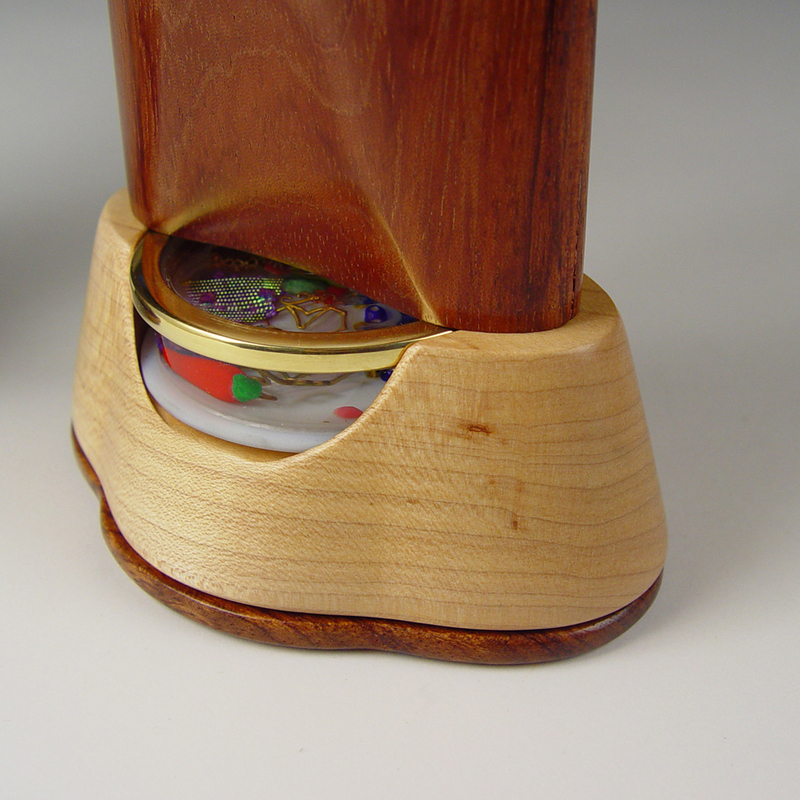 The batteries for the light are are replaced by removing the magnetically held lid on the bottom of the kaleidoscope. The Turniton is $330. The “Honey Jar” is a sculptural masterpiece with a limited-edition of only 25. It is viewed with both eyes. It was originally designed for an exhibit at the American Folk Art Museum, in New York City. 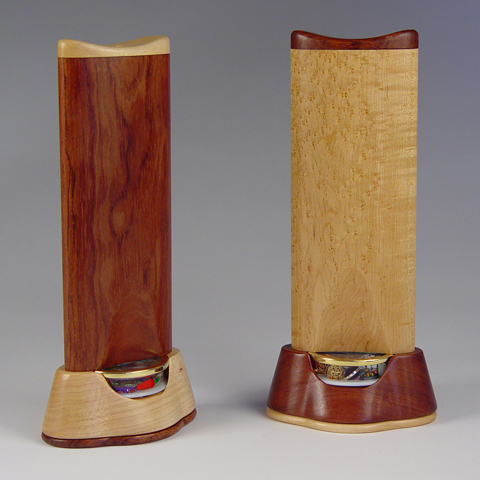 The angle of the sculpted scope body utilizes a variety of hardwoods and adjusts for different heights. This one is the largest kaleidoscope that Henry has made to date. It incorporates an extra large cylinder jar with colorful bead and objects, which is mounted on ball bearing rollers so that you can rotate the jar to allow the beads to move around and create beautiful patterns. The mirror system is large enough that you can get both eyes looking through, which creates a truly 3D environment you can get completely lost in. The scope itself can be raised or lowered to the viewing angle that suits the user and then locked in place. 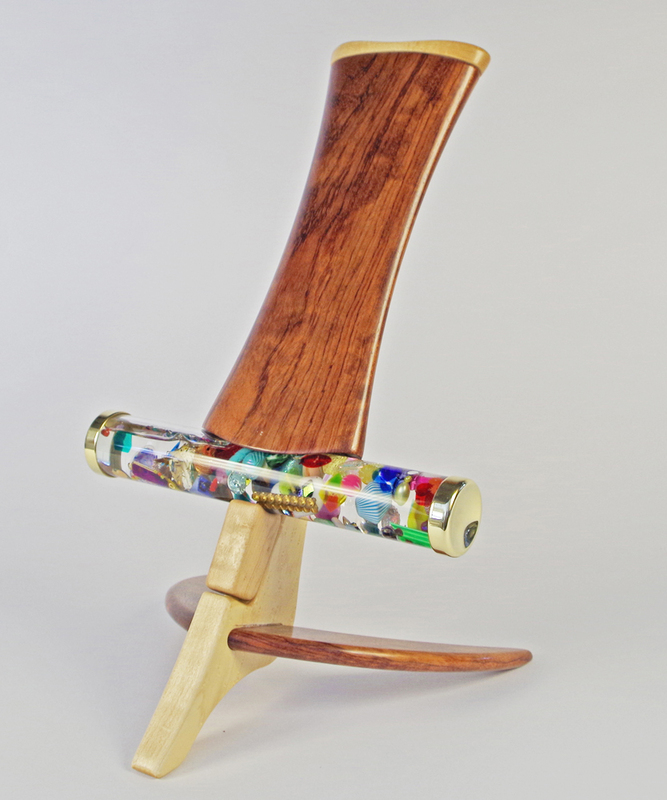 This kaleidoscope is between $5000 and $5500 depending on the wood design. During his youth, Henry Bergeson developed a love for things mechanical. Through the “real world” job experience, he developed a sense of the design. He was laid-off during the downturn in business in 1987, so he packed up and moved west. In Colorado, his new home, he followed his intuition and tried his hand at kaleidoscope building. 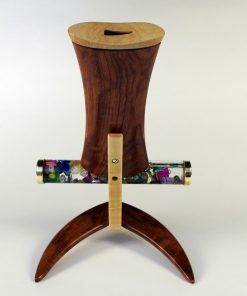 Henry makes all the parts for his kaleidoscopes, from carving and sanding the wood, to creating the cells or cylinders that hold the colorful beads and objects. Henry lives in Conifer, Colorado.